Your install script worked great! – Thank you! In testing .. (from a customer point of view) I received a pop-up. The Policy IS working .. but the message displayed thru the web browser is . . for the non technical confusing at best, and would make them think that email was broken. Is there any way to get a nice clean error message pop-up ? msg:	Invalid address: myaddress@gmail.com. com.zimbra.cs.mailbox.MailSender$SafeSendFailedException: MESSAGE_NOT_DELIVERED; chained exception is: com.zimbra.cs.mailclient.smtp.InvalidRecipientException: RCPT failed: Invalid recipient myaddress@gmail.com: 554 5.7.1 : Sender address rejected: We regret to inform you that you have exceeded the Maximum number of Outbound eMails sent from your account in the past (1) hour. This could mean that your eMail account has been compromised. Please contact our Support Team As-Soon-As- Possible to assist you. Sender address rejected: We regret to inform you that you have exceeded the Maximum number of Outbound eMails sent from your account in the past (1) hour. This could mean that your eMail account has been compromised. Please contact our Support Team As-Soon-As- Possible to assist you. Thank you .. I will continue to research this. And Thank you for your script! Can you also help with different configuration for different domains on the same Zimbra server. For different domain, you can create new Policies with member domain do you want and create new rule for Quotas. example: user1@mydomain.org and user2@mydomain.org are not allowed to send emails for more than 5 recipients at a time ? For the records, I was able to implement my needs, by creating a quota restriction on message count for a group of users for small period of time (say 30 sec for example). Thus, when a users sends a message to more than X recipients he will get his message rejected. Successfully implemented Policyd on ZImbra 8.5 based on your tutorial. I have some doubts. 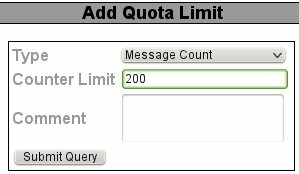 1- Quota is counting 1 e-mail message as 2 (one for reason=create and another one is for reason=update), so if i set 200 as quota limit i can send only 100 e-mails based on this scenario. How to make policyd count 1 mail message (to one recipient) as 1 quota count? My aim is to make all users can send 50 mails to external domain per day and special users/domains can send 200 mails to external domain per day. As for “PolicyD will count 2 emails for 1 email sent from webmail” I noticed it’s true for Zimbra v.8 (mine is 64-bit version on Ubuntu), but it regularly counts just 1 mail for Zimbra v.7 (mine is 32-bit version on Centos). Sorry for a late response. Are you have been make sure all policy you are create already changed disable from yes into no? Second point is success but i’m using MS Outlook 2013 still its counting as 2 for 1 mail. Thank you very much for the 2nd point. Hhm, it seems rather strange. How about other email clients? is still same as Outlook? I have tried clients like Live Mail and Zimbra Desktop, Both are making it 2. We are having 2 domains in same server & having total of 1600 users & 25 (DL) distribution list having 10 to 30 users added in each DL . I have implemented cbpolicyd bcoz of spamming. after some days users complaining us, that they are not able to send group mail i.e. DL. 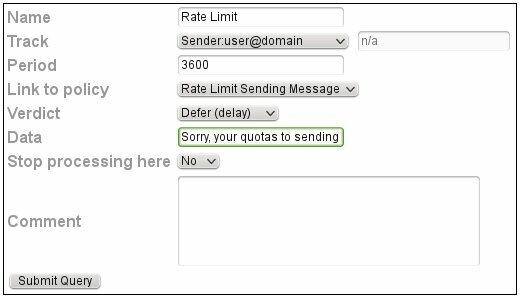 Limit sending emails from my domain per minute , but apply a rule to release some email send without restriction. How could ride this rule ? hello, good afternoon, I just finished configure my mail server after one entire day, everything works fine, but when i tried to configure policyd, i get an error. policyd does not start never. is the only service not running, i can access to the webgui but service never start. I appreciatte if you know something about this issue. Hi, thanks for this clear manual! I created a new policy and group (domain_users_1000) , with some individual email addresses. But it is stil not working fine…. Now it is is working fine! Cara paling gampang untuk mengecek kenapa tidak terkirim ke Gmail adalah cek log-nya. Can the webui be password protect to prevent unauthorized access? If not, how do we disable webui after we are done? I also realize that the delay does not work and function like reject once the quota is reach. Instead of delay, an email that exceed the quota simply get rejected. I agree with you for this statement. I think this caused you are is normal user, not as spammer. Thanks a lot for the tutorials on Policyd. Working just fine for me! Before this rules I had problems with users that compromised their passwords. Is there any way to set password to this administration panel?. Also at “Sender:user@domain” do i need to add my domain instead of “domain”?. I my mails are in Deferred Queues for long time, It is taking 2 to 3 hours to deliver. Can any one help me with this why it is taking too time to deliver the Mail. It’s depend your internet connection and how much email that sent in certain time interval. Thank you for you post. It worked perfect on webmail. But when I config accounts on Microsoft Outlook, and then sent email from outlook. and “cat /opt/zimbra/log/cbpolicyd.log”, there’s no any log for that email. I have check & see that: there’s a different from webmail & outlook, webmail using port 25 to send mail, outlook use port 587 to send mail, maybe that’s problem. please help checking this issue, I want to count all emails from webmail and outlook both. What the version of Zimbra you are using? It worked, you’re the best, thank you so so much. Use of uninitialized value in multiplication (*) at /opt/zimbra/cbpolicyd/lib/policyd-2.1/cbp/modules/Quotas.pm line 181. Use of uninitialized value in subtraction (-) at /opt/zimbra/cbpolicyd/lib/policyd-2.1/cbp/modules/Quotas.pm line 186. Use of uninitialized value in addition (+) at /opt/zimbra/cbpolicyd/lib/policyd-2.1/cbp/modules/Quotas.pm line 262. Use of uninitialized value in addition (+) at /opt/zimbra/cbpolicyd/lib/policyd-2.1/cbp/modules/Quotas.pm line 318.
did you find the solution to your problem? Hello Iman, is there any option that allow me to limit emails send by user to like 100 per hour and if they reach limit then all other emails go to hold queue. And after one hour it requeue another 100 mails of that user ? Mas kalo policy ini mau digunakan untuk semua user dalam satu mail server yang sama, apakah harus dimasukkan satu per satu di member policy nya? misal ada 10 user, user1@domain.com, user2@domain.com, user3@domain.com….dst..
Terima kasih atas pencerahannya bermanfat sekali soalnya IP saya sering diblock ISP karena diaggap broadcast spam. Fitur keamanan apa lagi yah mas yang cukup efektif untuk masalah ini? i have followed your manual and successfully got it running. but for testing i have set the sender limit to 5 but it is still sending out without any message or action taken. now it is working and zimbra passes me the message from the MTA which i have set. 1) how can i exclude single users from policies? as we want to set a limit for outbound messages per hour but we need to exclude single users from that. Can this be done by adding specific rules for these users? Yes, you should create every excluded account. You can remove your domain on source and change with your excluded account with sign ! I have deployed this rate limit in my Zimbra 8.7 server but I need an email notification alert when this threshold matched. Can you please let me know how I can achieve this? Thank you very much for this useful tutorial. I configured limit per day. How can I reset the counter, if the need arises? How do I know which user sent most emails? I’ve installed phpLiteAdmin and open database of PolisyD. So I was able to reset the counter. It is uncomfortable but acceptable way. Other question: is there a way to send a message to an administrator if a user has reached the limit? Finally, I found that the limit applies not only to outgoing messages, but also incoming. In database the addresses of incoming and outgoing in the same list. I have set a limit 4 letter and can not get more than 4 letters. This is unacceptable. We must receive without limit, and limit sending. sorry but finally i also found that excluding seams not to be working or i am doing something wrong? 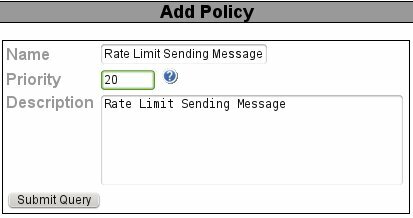 I have one policy for limiting the sending rate, but i want to exclude single users from that policy so i have set another policy with higher priority and another sending limit. But only the one with limiting the whole domain does work. i have just configured only one policy where i am explicitly excluding a user with !username@domain.com and if not this user sends emails, then the policy counts and if the user who is excluded sends, then the policy does not count. But this is a bit strange as when i am configuring another policy, the first stopps working. What is the proper way to set a limit for only one domain for each user but exclude only one from this policy? thank you, that works! Thanks for your help! Apakah dengan menggunakan PolicyD rate limit delay seperti diatas, jika sudah mencapai kuota email yang lainnya akan terkirim automatis setelah batas waktu habis atau kita harus mengirim ulang? maksud nya antrian email queue email yah mas….berarti bisa terkirim dong ke tujuan kalo ada di queue….kalo terkirim berarti spammer berhasil dong kirim email …? Benar mas. email akan terkirim ke tujuan jika masih ada di Queue. Tujuannya adalah untuk mempermudah email tersebut dikirim dari user siapa dan user mana yang suspect melakukan spamming. Jika email langsung di drop, untuk ngeceknya agak susah. Thank you Iman, for this article and video. I have installed policyd on my zimbra 8.6. and enabled tracking based on user@domain.com. If the user is sending one mail to 10 addresses, it is counting as 20 mails. it is creating problem. Can you please help me how to rectify this issue. Any help in this regard is highly appreciated. How can I release a specific user not be afected by the rule? we use a account to sendo e-mail from um monitoring system and on events can pass the limit. First thank for provide such useful article. i have zimbra 8.6 network edition, i configure policyd configuration as per your guide and set all user send 2000/day limit, but many time user try to send mail to internal domain user getting error – sender address rejected, and require to try mail again many times we also get such complain from many user’s. However, if I set member to “user@domain” (this is exactly what I entered), then nothing shows up in the log. Since I have over 40 domains on my server, what can I use so I don’t have to enter a member for each domain? Thank you iman. I did notice that also enforces the quota for incoming mail as well. Not sure I want to do that. Thanks to you not only do I have quota module working, but I learned enough to get greylisting module working as well!!! Each time I send an email with the quota configured it counts as two emails. Can anyone help me configure to only count as one email ? Because I want counter via webmail and email clients same. First I want to thank you a lot for making this nice tutorial. I’ve configured it and its working fine on my CentOS server with iRedmail. for test purpose I’ve set the limit to 1 email / minute and have set the Verdict to DEFER so its preventing me to send more than 1 mail if I use Roundecube. Now I tried with bulk mailing software. My mission is to delay the emails and send after the time period automatically by the server. But the problem comes when I try to send the emails from the bulk mailer software its still giving me the same error on my software. I’ve tried 2 different software but result is same. Can you please tell me what can I do to fix this? For your support I had configured policyd. It can be worked at the beginning,but when more and more user online and send the email,a lot of mail send failure . Now we set as default. Shall I change to large mailserver directly or change it according the accounts no..
Ok, thanks but the mailer-daemon sends the “out of office” msg of user. Do you delete this too? Jika saya ingin melimitasi pengiriman per request kirim bagaimana ya ? bukan per alamat tujuan..
Tell me how can I monitor the domain quota? I would like to monitor by zabbix. klo si spam tersebut terus menerus kirim email ke akun yg tidak ada di mail server bermasalah atau tdk terhadapat performa servernya? I am using Zimbra Collaboration Server 8.7.11 and I have created rate limit policy and it’s working perfectly fine. Now, I want to allow a single user to send more emails than allowed limit. For this, do I need to create a separate policy or I can add this user in same policy !user@domain.com. Would be great if you can help me this. Hi, Iman, thanks for sharing. I have version 8.8.8 and I have installed Cbpolicyd to limit the sending of emails as indicated in this guide. The problem is that each recipient is taken as a sent email and this complicates the use of distribution lists. In addition, when a user exceeds the limit, the emails are rejected instead of being sent to the deferred queue. Has this happened in your implementations? Have you managed to fix it? Hi Iman, first of all I would like to thank you for sharing this wonderful tutorial, I did implemented it on our server. I was wondering why was there a delay in delivering an email approx 30 minutes to 40 minutes after I have implemented this, where could I be possibly wrong? I have enabled cbpolicyd on my zimbra 8.7.7 version, but i couldn’t get log in /opt/zimbra/log/cbpolicyd.log.. please see my below logs are updating in my system. Help me to enable the same, also i have limit 3 mails only per hour, that is also not working.